So the recipe is pretty much in the title but let me tell you about this anyway. It all started with a trip to Costco. Actually it didn’t, it all started when I accidentally found myself in the middle of a store that sold only olive oil and balsamic vinegar. I remember passing it and thinking “How could anyone make a thriving business selling olive and vinegar, that’s like two products?” I had to check out this retail folly for myself. It was delightful, they didn’t just sell olive oil and balsamic vinegar, they sold like 30 flavours of each, and by flavour I don’t mean Greek olive vs Sicillian olive but infused with flavours like butter flavoured olive oil, Parmesan flavoured and even orange flavoured oils, and the vinegars were the same, raspberry, dark cherry, even ginger flavoured white balsamic. My mind was blown and I walked out the door with Parmesan cheese and garlic infused olive oil, went home and ate it tossed with pasta for a week. It was so good and so easy, and I got into pairings as well with the vinegars for dressings which I am underselling because I’m forgetting some of the combos but trust me this stuff is magic. And I never looked back. My “staples” would have to be wild mushroom and sage olive oil which is great on everything savoury, butter flavoured oil which is also magical on potatoes and veggies and lots of other wonderful things, and the vinegars I tend to use on their own for oil free salad dressing, the king of which being aged balsamic vinegar. The crown on the balsamic vinegar family at least in my limited exposure. That stuff is delicious, always priced at a premium, and absolutely divine. And we have, starting that night with fresh bread and oil for dipping. But also this little beauty of a recipe. 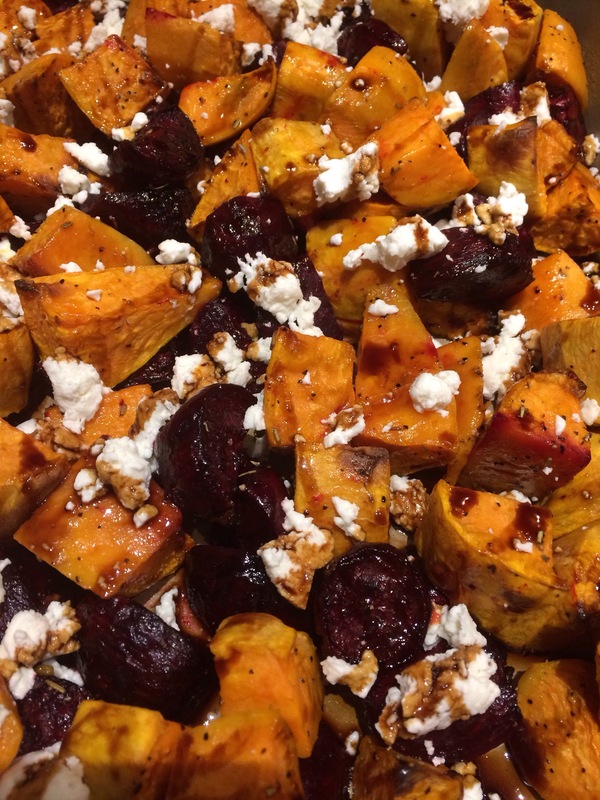 I had some beets in my fridge waiting to be cooked, and usually I boil them, slip off the skins and save for salads etc, but these are cold winter months and I was craving something a bit more comforting. I also had some carrots that needed to be used up and a few sweet potatoes. I peeled the whole bunch, cut them in similar sized chunks, tossed them in oil and seasoning, roasted them until they were done, then after cooling slightly I tapped them with goat cheese and a drizzling of the vinegar. So good guys, you have got to try it. This would work just fine with plain balsamic as well, also tasty, but the aged took it to a different level. The second time I made it, I tossed in a bit of rosemary as well, and that’s the recipe I will post below. I peel and keep my beets separate through the process because they turn everything pink, but if you are down with that, no problem. I keep the beets separate while cooking. Honestly this could be my dinner, but on the night in question we had this as a side dish for beef. It is also delicious as a cold leftover, so I’m thinking you could dice leftovers and throw on salad, or with spinach on a panini for that matter. 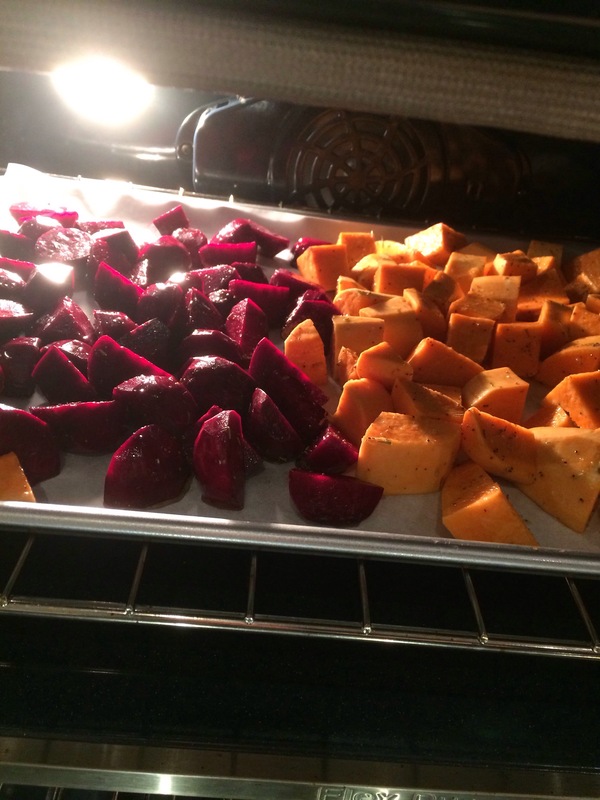 This batch was beets and sweet potato only, so good, especially once the cheese softens and the vinegar ties it all together.